So, this is what the morning after the night before feels like… no I was not wasted on alcohol or drugs (I’m tee-total and never touched drugs in my life) but this is an all new experience for me, a serious major book hangover. This was a book that brought me to my knees, both literally and figuratively. A book that was so all-consuming I could not put it down, not for one second. If I wasn’t reading it, I was listening to it. This is the book that kept me awake for most of the night as what transpired on those pages was dissected and analysed piece by piece. As my thoughts, feelings, opinions and emotions were spun around in my brain like a washing machine on full spin. These were the characters that never left me alone for a minute while my heart broke and my head hurt multiple, multiple times. This book was seriously that good and extremely thought provoking. This is a book that deserves to be read. Colleen Hoover never ceases to amaze me. She is one of the few authors that I insist on going in blind, no synopsis, no reviews, nothing. She is the one author that I can guarantee will dazzle me with her natural, gifted talent. Writing that is pure, emotional, thought provoking, mesmerising, honest and multi layered. Layers upon layers of beautiful prose that you cannot help be consumed by and characters that are so realistic, so relatable that they consume you from first to last word. I lived and breathed It Ends with Us, raw, unadulterated story-telling at its finest. 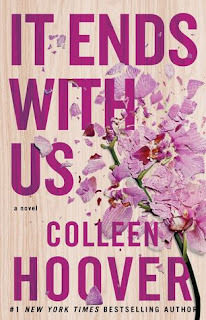 Colleen Hoover went above and beyond with this one, this was from the heart, from life experiences, I felt the honesty, the pain, the passion, every word, every sentence, every paragraph, every page, every chapter was written in Colleen Hoover’s blood and you knew it and you most definitely felt it. This was Colleen Hoover in words. This woman who is the epitome of humble, selfless, generous put herself out there and it is one book that I will never, ever, forget. Lily Bloom was a stunning character, like Colleen Hoover herself, she was selfless and humble. She put others before herself, her personality was intoxicating and Colleen Hoover did an amazing job bringing her to life. While her story definitely has its ups and downs, Lily dealt with them maturely and with all the best intentions, while trying to keep herself and everyone else around her happy. Heart breaking decisions that were tough to make and harder to break, but made her stronger. Lily was a woman that learned from past mistakes, made by herself and those around her, she soaked up life experiences like a sponge and her positivity and empathy made her the woman she was. She was endearing, lovable she was just darn perfect. This is not a love triangle, far from it. This is a story about a woman that has only ever loved twice, and when she loves, she loves completely. Atlas was her first love, a boy that had nothing but gave everything. A boy that was her best friend, her confidante, her boyfriend until life wrenched him away. He had to do what he had to do but it didn’t make his loss any easier to take. Ryle, I adored him, despite his flaws, he was a man that wanted to be better, to be the man that Lily deserved. He had never loved, never wanted to, nor thought he deserved it, but meeting Lily changed everything, she was his game changer. What he had always thought was out of reach he grabbed with both hands. He loved hard, he loved fierce, he was passionate, protective and just a stunning human being, but even the biggest diamond has its imperfections. The naked truth? Colleen Hoover destroyed me, one scene in particular I have running around my head on repeat and as I am sitting here typing I have streams and streams of tears running down my face. As much as I was uplifted and totally consumed by Lily’s story I had a deep sense of foreboding throughout. What I thought would happen, didn’t, thankfully, but having that in the back of mind constantly only added to my sense of unease and with each page turned I felt more and more sick. But and this is a huge BUT, nothing could have prepared me for how this book turned out. Definitely the right ending, but the raw, emotional out pouring onto those pages decimated me. My heart physically ached, I was distraught and at the end I wanted more. 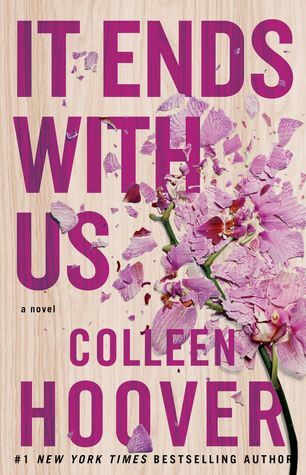 It may have ended with It Ends with Us (that title is PERFECT, the meaning behind it, gah, brought me to tears yet again) but all these characters have more to give, more life lessons to make and I’m hoping that Colleen Hoover can find it in her emotional arsenal to write more. Once again I bow down to the greatness that is Colleen Hoover, how can I read a book after that?